Viareggio is a town located in Tuscany and it is the main city of the Tuscan Riviera called Versilia. The carnival in Viareggio was first celebrated in 1873, when a group of nobles decided to start a parade of carriages in the city. The parade became so successful in attracting everybody that, the year after, the carriages of nobles were placed side by side with agricultural ones. 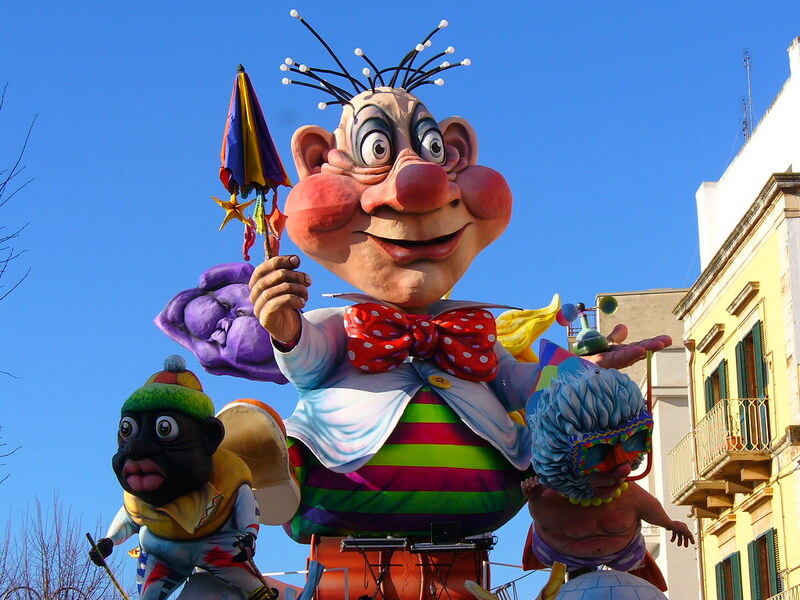 After World War I (WWI), the Carnival in Viareggio started to be celebrated again in 1921. The WWII stopped again the celebration of the carnival, but after the end of the war and the reconstruction of Viareggio, the event was restored. In the late 1960’s, appeared for the first time the political satire, which until now characterizes this satirical carnival. Nowadays, the figures on the carriages are made of paper mache (papier-mâché). In 2001, a new area for making the “masked carriages”, inside the Cittadella, was inaugurated. The carriages are located in hangars that can be visited all year long, not only for carnival. The square outside the hangars is also used for concerts and various events, such as the Festival of Gaber (named after the famous Italian singer and actor, Giorgio Gaber, 1939–2003). This year the Carnival of Viareggio takes place from the 3rd of February until the 3rd of March. Ivrea is a small town of almost 25 thousand inhabitants in the province of Turin, in the region called Piemonte. 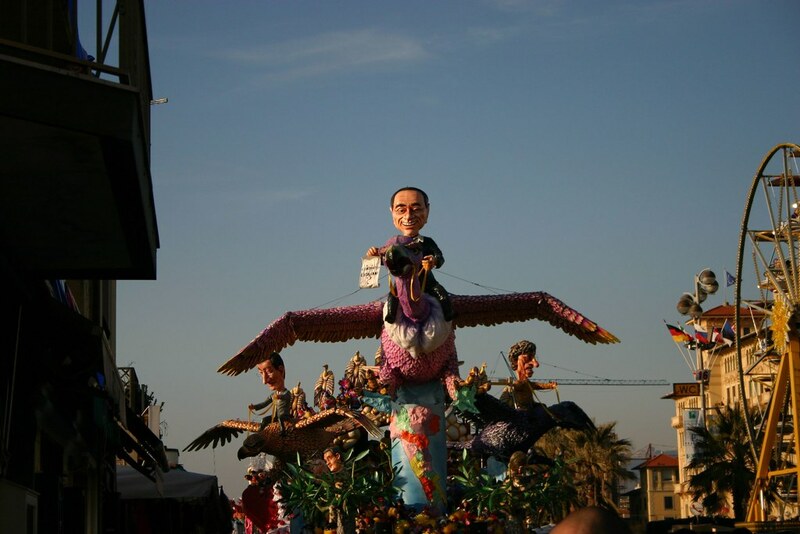 The carnival of Ivrea is usually referred to as “historical” for its link with history. In fact, in the Middle Ages, the city was subjected to Lord Ranieri of Biandrate, who imposed very high taxes on the population. So, the people rebelled against the tyrant and destroyed his castle for the first time in 1194. The story repeated itself with Lord William VII of Monferrato, and the people destroyed the castle for the second time in 1266. To symbolize this fight for freedom, the Battle of the Oranges takes place nowadays. 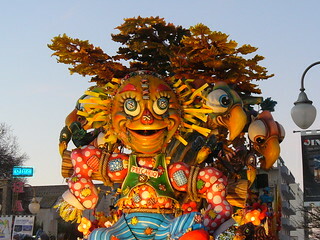 It is the most spectacular event of the carnival. In the battle, people standing on carriages represent the soldiers of the Tyrant, and the teams of pedestrian “orange-throwers” represent the rebelling inhabitants. The two teams throw oranges against each other and may also involve spectators that do not wear the Phrygian cap, symbol of freedom and pursuing of liberty. The legend surrounding the Carnival of Ivrea tells that in order to exercise his “ius primae noctis” —i.e. his right to sleep with a bride the first night after her wedding— with Violetta, a local miller’s daughter, the Tyrant of the city ordered her to go to his castle. The newly-wed woman went to the castle hiding a knife within her hair, with which she killed the Tyrant. She soon became the symbol of the people’s rebellion against the taxes on wedding and wheat. 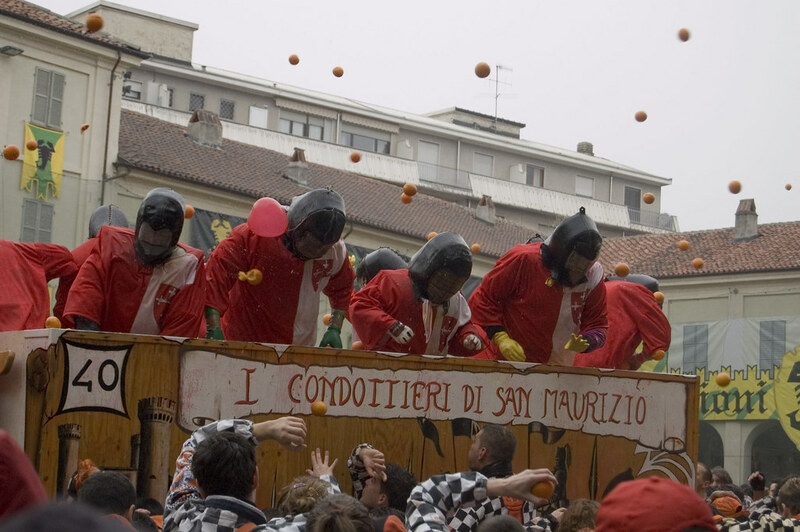 Nowadays, the Battle of the Oranges, taking place on Shrove Tuesday, signifies the end of the carnival, and the best “orange-throwers” both on foot and on carriage are nominated. Putignano is a small town and a well-known holiday resort in the south of Italy, in the region called Apulia. The Carnival of Putignano dates back to the Middle Ages, when the Knights of Malta brought to Italy the relics of Saint Stephen. Putignano was chosen as the locality for this relic translation. After the religious procession to accompany the Saint’s relics to the church, the farmers abandoned themselves to dancing and singing, making jokes and reciting poems and satires. This was the origin of the “Propaggini“, a feast, where several poets in farmers’ clothes declaim poems and satires in the local dialect. Technically, the carnival here starts on the 26th of December, when the city gives as a present to the church a candle for having their sins to be committed during carnival forgiven. In the evening, the “Propaggini” takes place. In the months following this event, several celebrations happen, such as the “Feast of the Bear” (Italian: la Festa dell’orso) on the 2nd of February and the parades of allegorical carriages around the town. The carnival ends on Shrove Tuesday with the Funeral of the Carnival. 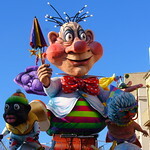 In this last parade, a funeral cortège proceeds along the streets holding a pig made up with paper-mache, which represents carnival and its excesses. The pig is burnt in the main square of the city as a purification rite. The last minutes of Carnival’s life are beat by a huge bell also made up with paper-mache and called “Campana dei Maccheroni“. In these last moments visitors and inhabitants meet here once again to dance and sing before a glass of wine and a plate of pasta waiting for the day to come to a close. Enjoy the wonderful Italy during Carnival, book your accommodation and visit these beautiful places! 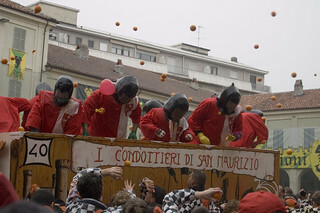 “Carri da Getto Battle of Oranges – Battaglia delle Arance 2007 – Ivrea” photo by Giò-S.p.o.t.s. This entry was posted Thursday, February 14th, 2013 at 10:13	and is filed under Events, Tradition. Both comments and pings are currently closed.